12-28-17 No D Tenor psalteries in stock right now. You can order one with a shoirt waiting period. Here are some jam tunes featuring a D tenor psaltery. These were recorded this past weekend. The other instruments are appalachian dulcimer, guitar, and bass. The D Tenor is basically a larger version of my D Psaltery. Because it has all wound strings and is a little larger, the lowest note is an octave below the lowest note on the D Psaltery. It starts at A3 (A below middle C) and goes up two and one half octave to D6 (D two octave above middle C). Because it is a diatonic psaltery (tuned to one key), this is not the bowed psaltery to choose for all around playing. To be able to play in many different keys you need a chromatic bowed psaltery. The single key of D limits you somewhat, but that is the idea behind this psaltery. It allows you to play easily in the key of D. If you play regularly with Appalachian dulcimer players, you know that is the key they mostly play in. I would guess that is true ninety percent of the time, occasionally going to the key of G. This has been my experience at most jams I have attended. You can still choose to tune the three C# notes down to C and play in G.
Great for easily playing along with the dulcimer. 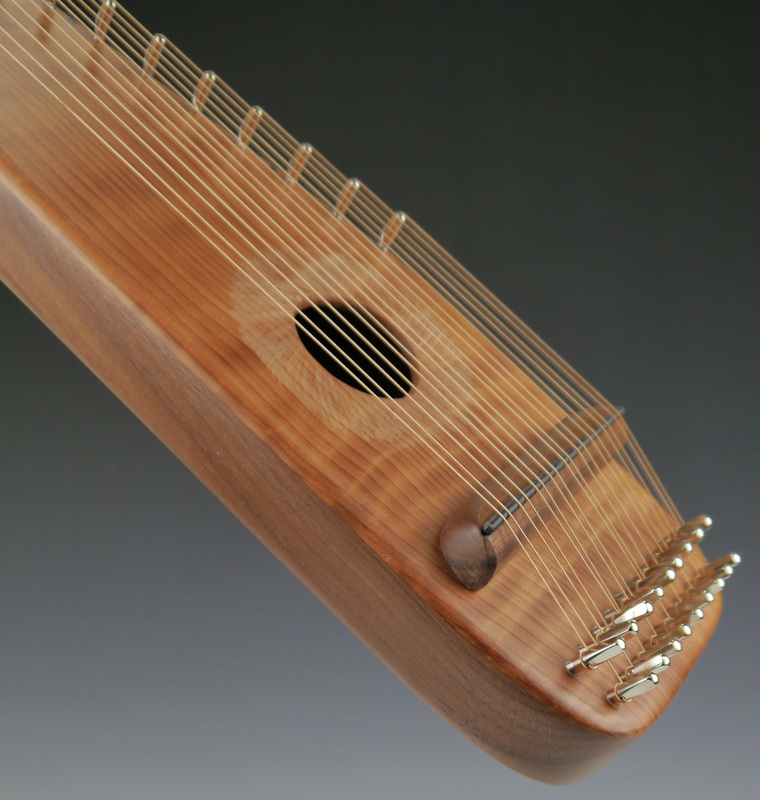 Faster dulcimer tunes can be a problem with a chromatic psaltery. You have to be able to quickly reach to that left side of the C# and F# notes for that key. This is where a lot of psaltery players get left in their dust. Having all the notes of the D scale on one side will allow you to play faster and smoother. That's where this diatonic psaltery really shines. These include the one bow, a nice padded case, tuning wrench, rosin, tuning/stringing chart, extra strings, and a two hour long instructional DVD. They have eighteen phosphor bronze wound guitar strings. The dimensions are 21" long, 5" wide, and around 2" thick(including the pins, bridge, and strings). The D's are marked with single black dots, the A's are double black dots. These can be double bowed. Purchase the adjustable tripod holder and extra bow for $50. If you already have one of my tripod holders you can use it with this psaltery, but you will need to add an extra pad at the bottom. This psaltery is too narrow to work with the two that are now on there. This won't affect being able to use the tripod holder with the chromatic tenor. Remind me and I'll include the extra pad. The soundboard is some really nice curly redwood. The back and bridge are made of black walnut. questions, post them on there or pm me.